Home NBI NBI Clearance valid ID. ANNOUNCEMENT: The PUBLIC is hereby advised that effective October 2, 2017, the NBI will be issuing the MULTI-PURPOSE CLEARANCE. This is in line with the present administration’s effort to simplify government services. Please be guided accordingly. 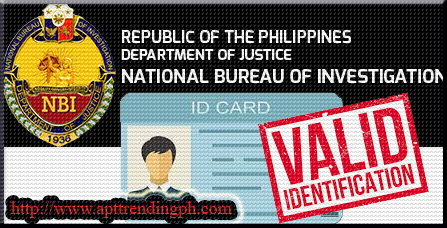 VALID IDS accepted in applying NBI Clearance. How to apply NBI Clearance Online for New Applicant. How to RENEW an old applicant of 2014-2017 NBI Clearances?